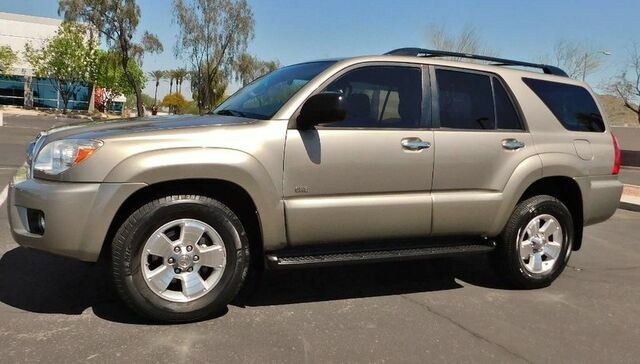 2007 TOYOTA 4RUNNER SR5 V6 2-Wheel Drive with 101,000 babied highway miles. Driftwood Pearl Metallic paint w/ Taupe Cloth Interior. Great Shape all over and this one rides and drives as good as they come. This rig has all the right power options and still starts, sounds, shifts and smells great. Extra tight/true steering and everything works properly. This rig has been fully inspected/serviced and is ready for a cross country trip anywhere in style, right now! The exterior and interior are both in waayyy above average condition for the year and mileage. Zero signs of abuse or neglect. Interior is wayyy cleaner than anyone should expect a 12 year old rig to be in. The cosmetics are all great but it's the ride and drive that will sell you on this SUV. Zero Let Downs, looks exactly as clean in person as the pictures shop it to be. Read over 1,000 100% positive customer Ebay feedbacks! We have been selling on Ebay over 17 years and know what it takes to make a deal painless. We are a member of The Better Business Bureau with an A Rating. We are located minutes from Phoenix International Airport and will provide free ground transportation to our dealership. Please read the "Terms Of Sale" section. $299.95 Documentation Fee applies to all deals. Sales tax may apply. Call Mark for a detailed walk around anytime BEFORE auction closes!